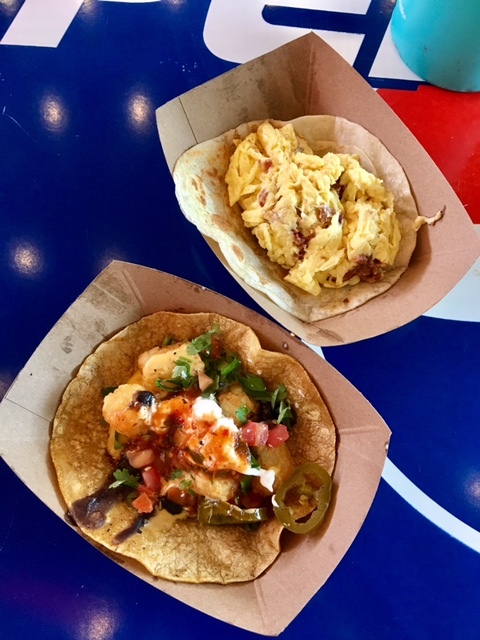 If you have a little free time on Tuesday or Thursday morning, you should find your way to Tacos A Go Go in Oak Forest for some down dog. 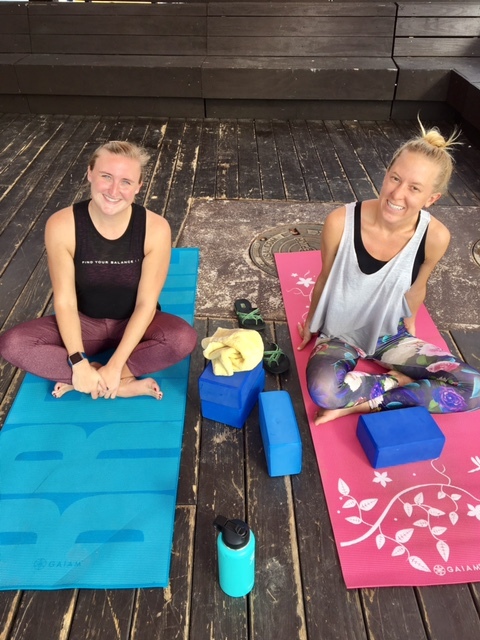 Twice a week from 8:45am to 9:45am, yogis converge on the outdoor patio to get their namaste on at a free community yoga class. 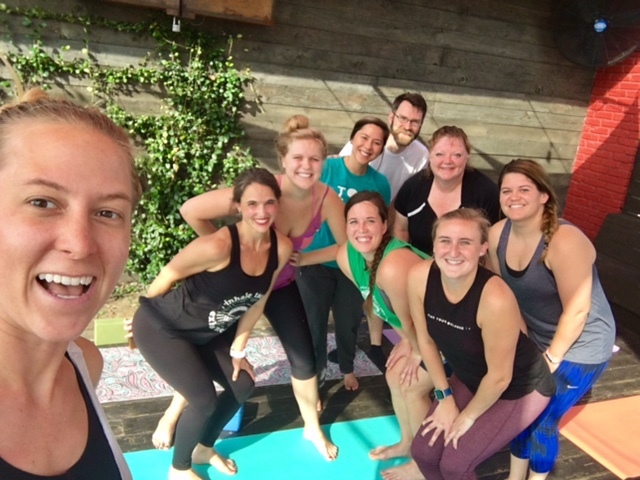 I went last week and sweated my way through the most unique yoga class I’ve been to in a long time. The Tacos A YoGa class was taught by Andria of Yoga Better and was focused on alignment and subtle body positioning. You might even describe it as “physical therapy yoga.” There was no vinyasas in this class. No chatarungas. Only a little bit of downward facing dog. Instead the class was filled with balancing, twisting, stretching, and strengthening of tiny muscles you didn’t know existed (so similar to physical torture therapy). If you don’t have a mat, don’t worry! Andria brings many extras, as well as a bag full of blocks. 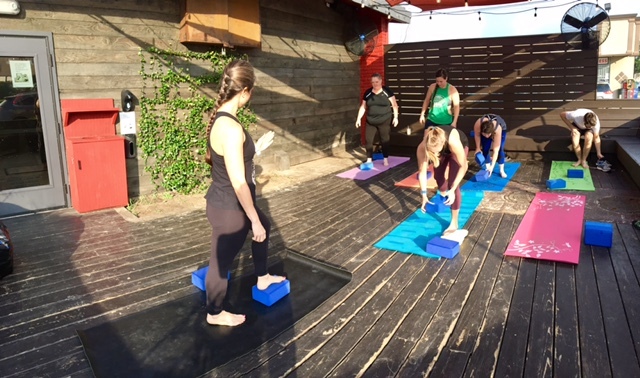 We used a pair of blocks for most of the class to go deeper into postures and find stability. The Yoga Better, which is run by Andria and her husband Andrew, is unique in the sense that they took athletic moves from cross fit, running, etc. and broke them down into their essential movements to understand the subtle differences between something like a good squat, a great squat and a potential-injury-inducing squat. They took this information to reinvent a yoga practice to combat poor posture and training in other activities. As I write this post, I’m itching to go back because the class was so refreshing and different. I’ve done so much yoga over the course of my life, my body has developed an insane amount of muscle memory to do warrior 1, tree pose, utkatasana, etc. This brand of yoga was challenging in its simplicity and uniqueness. We were doing finger push-ups, balancing on blocks, focusing on external rotation, and deeeeeeep back bends. Overall, the yoga class at Tacos A Go Go was pretty cool and I’m definitely looking forward to checking out one of the Yoga Better classes in their studio off Washington. Tags: Blonde Roast Coffee, breakfast tacos, Oak Forest, Physical Therapy, tacos, Tacos A Go Go, yoga, Yoga Better. Bookmark the permalink.